A disturbing video that seemingly shows an officer being stalked has the local law enforcement community on edge. 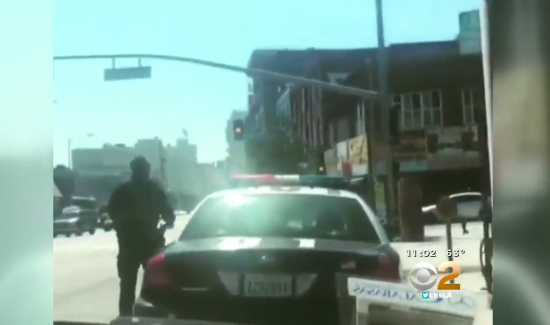 The footage, posted on social media, begins with a Los Angeles police officer getting out of his patrol car, followed by a shot of a handgun held by the person shooting the video. That individual was recording the video from inside a car parked behind the officer. The video, which had gone viral, is enough for the wife of an L.A. police officer to think someone may be sending a threat. “It’s completely frightening, and I know that a lot of the wives are scared,” she said. She is part of the LAPD Wives Association. Many of the members have seen the video, and so have many officers.